Aisha (Aija Andrejeva) was born on January 16, 1986 in the city of Ogre. The father of the singer, Alex, is the solo singer of the legendary rock band "Opus Pro". Aisha spent her childhood in Lielvarde. Starting at the age of ten years, she began taking flute and piano lessons at the Music School of Lielvarde. One year later, she started playing in the local brass band "Sirius". In the year 1991, little Aija took part for the first time in the young vocalist competition "CДЃlis '91", where she took the 2nd place. At the age of 11, when competing in the young flutist competition, she got the 2nd place in the region and the 12th place across the whole country. At the age of 12, Aisha debuted at the "Young conductor's parade", where she reaped the laurels of victory. In the year 2002, being in a status of a full-fledged bandmaster, Aija conducted the brass band "Sirius" in its 5 year anniversary concert. In the year 2004, motivated by her friends, she entered the TV5 reality show "Musical Factory Theatre". Following the first week's concert, she got the jury award and recognition from the composer Raimonds Pauls. The second week of the show brought several proposals for Aisha to perform together with "Opus Pro". At the end of year 2004, Aisha along with her father, Alex, performed the song "You and me" (Tu un es) at the magnificent concert on the banks of River Daugava, to honour accession of Latvia to the European Union. At the finals, owing thanks to the voting audience, Aisha got the first place and the grand prize - a brand new Peugeot 206. Within the framework of the show, throughout the whole summer, Aisha participated in the musical "That is the way it should be" (TДЃ ir jДЃnotiek), giving performances almost around the whole country. After the show, Aisha engaged in active collaboration with the band - "Opus Pro" - participated in their concerts, and the participant and composer of the band, Harijs ZariЕ†ЕЎ, has written several songs for her. In July of the year 2004, Aisha and Alex performed at the Liepaja festival "Caines beach party" with the song "You and me", and got the first place - the award for the first place was a video for the song. In December of the year 2004, at the LNT Music Video Annual Awards Ceremony, Aisha got the first place as the "Soloist of the year". In February of the year 2005, Aisha premiered on the stage of Daile Theatre, playing the leading role of Dorothy in the musical performance "Wizard of Oz". In the spring of the year 2005, Aisha graduated high-school and started collaboration with the band "Credo" - participated in making the album "Surrender to me" (Padodies man) by "Credo" and thereafter also in the concert tour following the release. On July 8, 2005, at the Ogre open air music hall, Aisha together with "Opus Pro" performed an hour long concert programme as the warm-up band for the popular Russian band "BI - 2", that way exposing her art also to a significantly broader audience of the Russian-speaking population. Aisha gives concerts both - as a soloist, as well as together with "Opus Pro", "Credo", and Riga Dome Choir School's boy choir. In the year 2006, Aisha started hosting the show of LTR "Loves me - loves me not! ", and recorded her album together with "Opus Pro". The record company was "Mikrofona ieraksti". In the year 2007, Aisha participated in the LNT show "Two stars" and recorded new songs. She now performs in a status of a solo artist. In the year 2008, Aisha is making her first solo album in collaboration with the company "Mikrofona ieraksti" and new record producers. Takes part in the super popular show "Dance with a star 2", where she finishes runner-up. In 2009 Aisha represents Latvia at the most popular contest in all former Soviet Union territories "New Wave". Got 3d place. MicRec released her successful album "Dveselite" what has been nominated for the "best Pop Album" of the year 2009 at Latvian Grammy. Listen to Aisha's entry "What For?" here and watch video of the national final performance here. РђРёС€Р° (РђР№СЏ РђРЅРґСЂРµРµРІР°) СЂРѕРґРёР»Р°СЃСЊ 16РіРѕ СЏРЅРІР°СЂСЏ 1986 РіРѕРґР° РІ РіРѕСЂРѕРґРµ РћРіСЂРµ. Р•Рµ РѕС‚РµС† - СЃРѕР»РёСЃС‚ Р»РµРіРµРЅРґР°СЂРЅРѕР№ СЂРѕРє-РіСЂСѓРїРїС‹ "Opus Pro". РЎРІРѕРµ РґРµС‚СЃС‚РІРѕ РђРёС€Р° РїСЂРѕРІРµР»Р° РІ Р›РёРµР»РІР°СЂРґРµ. РќР°С‡РёРЅР°СЏ СЃ 10 Р»РµС‚ Р±СЂР°Р»Р° СѓСЂРѕРєРё РёРіСЂС‹ РЅР° С„Р»РµР№С‚Рµ Рё С„РѕСЂС‚РµРїРёР°РЅРѕ РІ РјСѓР·С‹РєР°Р»СЊРЅРѕР№ С€РєРѕР»Рµ Р›РёРµР»РІР°СЂРґРµ. Р“РѕРґ СЃРїСѓСЃС‚СЏ, РЅР°С‡Р°Р»Р° РёРіСЂР°С‚СЊ РІ РјРµСЃС‚РѕР№ РґСѓС…РѕРІРѕР№ РіСЂСѓРїРїРµ "Sirius". Р’ 1991 РіРѕРґСѓ РјР°Р»РµРЅСЊРєР°СЏ РђР№СЏ РІРїРµСЂРІС‹Рµ РїСЂРёРЅСЏР»Р° СѓС‡Р°СЃС‚РёРµ РІ РєРѕРЅРєСѓСЂСЃРµ СЋРЅС‹С… РІРѕРєР°Р»РёСЃС‚РѕРІ "Calis'91", РіРґРµ Р·Р°РЅСЏР»Р° РІС‚РѕСЂРѕРµ РјРµСЃС‚Рѕ. Р’ РІРѕР·СЂР°СЃС‚Рµ 11 Р»РµС‚, РїСЂРёРЅРёРјР°СЏ СѓС‡Р°СЃС‚РёРµ РЅР° РєРѕРЅРєСѓСЂСЃРµ РґРµСЂРµРІСЏРЅРЅС‹С… РґСѓС…РѕРІС‹С… РёРЅСЃС‚СЂСѓРјРµРЅС‚РѕРІ Р·Р°РЅСЏР»Р° 2Рµ РјРµСЃС‚Рѕ РІ СЃРІРѕРµРј СЂРµРіРёРѕРЅРµ Рё 12Рµ РїРѕ СЃС‚СЂР°РЅРµ. Р’ РІРѕР·СЂР°СЃС‚Рµ 12 Р»РµС‚ РђРёС€Р° РґРµР±СЋС‚РёСЂРѕРІР°Р»Р° РЅР° "РџР°СЂР°РґРµ РјРѕР»РѕРґС‹С… РґРёСЂРёР¶РµСЂРѕРІ", РіРґРµ СЃРЅРёСЃРєР°Р»Р° Р»Р°РІСЂС‹ РїРѕР±РµРґРёС‚РµР»СЏ. Р’ 2002 РіРѕРґСѓ РђР№СЏ РґРёСЂРёР¶РёСЂРѕРІР°Р»Р° РґСѓС…РѕРІРѕР№ РіСЂСѓРїРїРѕР№ "Sirius" РЅР° РєРѕРЅС†РµСЂС‚Рµ, РїРѕСЃРІСЏС‰РµРЅРЅРѕРј РµРµ 5Р№ РіРѕРґРѕРІС‰РёРЅРµ. Р’ 2004 РіРѕРґСѓ, РїРѕ СЃРѕРІРµС‚Сѓ РґСЂСѓР·РµР№, РђРёС€Р° РїСЂРёРЅРёРјР°РµС‚ СѓС‡Р°СЃС‚РёРµ РІ СЂРµР°Р»РёС‚Рё С€РѕСѓ РєР°РЅР°Р»Р° TV5 "Musical Factory Theater". РќР° РїРµСЂРІРѕР№ РЅРµРґРµР»Рµ С€РѕСѓ РѕРЅР° Р·Р°РІРѕРµРІС‹РІР°РµС‚ РїСЂРµРјРёСЋ Р¶СЋСЂРё Рё РїСЂРёР·РЅР°РЅРёРµ РєРѕРјРїРѕР·РёС‚РѕСЂР° Р Р°Р№РјРѕРЅРґР° РџР°СѓР»СЃР°. РќР° РІС‚РѕСЂРѕР№ РЅРµРґРµР»Рµ, Рє РЅРµР№ РїРѕСЃС‚СѓРїР°СЋС‚ РїСЂРµРґР»РѕР¶РµРЅРёСЏ Рѕ СЃРѕРІРјРµСЃС‚РЅС‹С… РІС‹СЃС‚СѓРїР»РµРЅРёСЏС… СЃ РіСЂСѓРїРїРѕР№ "Opus Pro". Р’ РєРѕРЅС†Рµ 2004 РіРѕРґР° РђРёС€Р° РІРјРµСЃС‚Рµ СЃРѕ СЃРІРѕРёРј РѕС‚С†РѕРј РђР»РµРєСЃРѕРј РёСЃРїРѕР»РЅСЏРµС‚ РїРµСЃРЅСЋ "Tu un es" РЅР° РєРѕРЅС†РµСЂС‚Рµ, РїСЂРѕС€РµРґС€РµРј РЅР° Р±РµСЂРµРіСѓ СЂРµРєРё Р”Р°СѓРіР°РІР°, РїРѕСЃРІСЏС‰РµРЅРЅРѕРј РІСЃС‚СѓРїР»РµРЅРёСЋ Р›Р°С‚РІРёРё РІ Р•РІСЂРѕРїРµР№СЃРєРёР№ РЎРѕСЋР·. Р’ С„РёРЅР°Р»Рµ С€РѕСѓ, Р±Р»Р°РіРѕРґР°СЂСЏ РіРѕР»РѕСЃР°Рј С‚РµР»РµР·СЂРёС‚РµР»РµР№, РђРёС€Р° Р·Р°РЅРёРјР°РµС‚ РїРµСЂРІРѕРµ РјРµСЃС‚Рѕ Рё РїРѕР»СѓС‡Р°Рµ РіР»Р°РІРЅС‹Р№ РїСЂРёР· - РЅРѕРІРµРЅСЊРєРёР№ РџРµР¶Рѕ 206. Р’ СЂР°РјРєР°С… С€РѕСѓ, РІ С‚РµС‡РµРЅРёРё РІСЃРµРіРѕ Р»РµС‚Р° РђРёС€Р° РїСЂРёРЅРёРјР°РµС‚ СѓС‡Р°СЃС‚РёРµ РІ РјСЋР·РёРєР»Рµ "Ta ir janoutiek" РІС‹СЃС‚СѓРїР°СЏ РїРѕ РІСЃРµР№ СЃС‚СЂР°РЅРµ. РџРѕСЃР»Рµ С€РѕСѓ РђРёС€Р° РЅР°С‡РёРЅР°РµС‚ Р°РєС‚РёРІРЅРѕРµ СЃРѕС‚СЂСѓРґРЅРёС‡РµСЃС‚РІРѕ СЃ РіСЂСѓРїРїРѕР№ "Opus Pro", РїСЂРёРЅРёРјР°СЏ СѓС‡Р°СЃС‚РёРµ РІ РёС… РєРѕРЅС†РµСЂС‚Р°С…, СѓС‡Р°СЃС‚РЅРёРє Рё РєРѕРјРїРѕР·РёС‚РѕСЂ РіСЂСѓРїРїС‹ РҐР°СЂРёР№СЃ Р—Р°СЂРёРЅСЊС€ РЅР°РїРёСЃР°Р» РґР»СЏ РЅРµРµ РЅРµСЃРєРѕР»СЊРєРѕ РїРµСЃРµРЅ. Р’ РёСЋР»Рµ 2004 РіРѕРґР° РђРёС€Р° Рё РђР»РµРєСЃ РІС‹СЃС‚СѓРїР°СЋС‚ РЅР° С„РµСЃС‚РёРІР°Р»Рµ РІ Р›РёРµРїР°Рµ "Caines beach party" СЃ РїРµСЃРЅРµР№ "Tu un es" Рё Р·Р°РІРѕРµРІС‹РІР°СЋС‚ РїРµСЂРІРѕРµ РјРµСЃС‚Рѕ, РїСЂРёР·РѕРј СЏРІР»СЏРµС‚СЃСЏ РІРѕР·РјРѕР¶РЅРѕСЃС‚СЊ СЃРЅСЏС‚СЊ РІРёРґРµРѕРєР»РёРї РЅР° РїРµСЃРЅСЋ. Р’ РґРµРєР°Р±СЂРµ 2004 РіРѕРґР° РЅР° РµР¶РµРіРѕРґРЅРѕР№ С†РµСЂРµРјРѕРЅРёРё РІСЂСѓС‡РµРЅРёСЏ Р»Р°С‚РІРёР№СЃРєРёС… РјСѓР·С‹РєР°Р»СЊРЅС‹С… РїСЂРµРјРёР№, РђРёС€Р° Р·Р°РЅРёРјР°РµС‚ РїРµСЂРІРѕРµ РјРµСЃС‚Рѕ РІ РЅРѕРјРёРЅР°С†РёРё "РџРµРІРёС†Р° РіРѕРґР°". Р’ С„РµРІСЂР°Р»Рµ 2005 РѕРЅР° РІС‹СЃС‚СѓРїР°РµС‚ РЅР° СЃС†РµРЅРµ С‚РµР°С‚СЂР° Daile, РёСЃРїРѕР»РЅСЏСЏ Р·Р°РіР»Р°РІРЅСѓСЋ СЂРѕР»СЊ Р”РѕСЂРѕС‚Рё РІ РјСѓР·С‹РєР°Р»СЊРЅРѕР№ РїРѕСЃС‚Р°РЅРѕРІРєРµ "Р’РѕР»С€РµР±РЅРёРє Р�Р·СѓРјСЂСѓРґРЅРѕРіРѕ Р“РѕСЂРѕРґР°". Р’РµСЃРЅРѕР№ 2005 РіРѕРґР° РѕРЅР° Р·Р°РєР°РЅС‡РёРІР°РµС‚ С€РєРѕР»С‹ Рё РЅР°С‡РёРЅР°РµС‚ СЃРѕС‚СЂСѓРґРЅРёС‡РµСЃС‚РІРѕ СЃ РіСЂСѓРїРїРѕР№ "Credo", РїСЂРёРЅРёРјР°РµС‚ СѓС‡Р°СЃС‚РёРµ РІ СЃРѕР·РґР°РЅРёРё Р°Р»СЊР±РѕРјР° "Padodies man" Рё РІС‹СЃС‚СѓРїР°РµС‚ РІ РєРѕРЅС†РµСЂС‚РЅРѕРј С‚СѓСЂРµ РґР»СЏ РµРіРѕ РїСЂРѕРјСѓС€РµРЅР°. 8 РёСЋР»СЏ 2005 РіРѕРґР° РЅР° С„РµСЃС‚РёРІР°Р»Рµ РІ РћРіСЂРµ РђРёС€Р° РІРјРµСЃС‚Рµ СЃ "Opus Pro" РґР°СЋС‚ С‡Р°СЃРѕРІРѕРµ РІС‹СЃС‚СѓРїР»РµРЅРёРµ РЅР° СЂР°Р·РѕРіСЂРµРІРµ РїРѕРїСѓР»СЏСЂРЅРѕР№ СЂРѕСЃСЃРёР№СЃРєРѕР№ РіСЂСѓРїРїС‹ "Р‘Рё-2", С‚РµРј СЃР°РјС‹Рј РґРµРјРѕРЅСЃС‚СЂРёСЂСѓСЏ СЃРІРѕРµ РёСЃРєСѓСЃСЃС‚РІРѕ Р±РѕР»РµРµ С€РёСЂРѕРєРѕР№ Р°СѓРґРёС‚РѕСЂРёРё СЂСѓСЃСЃРєРѕ-РіРѕРІРѕСЂСЏС‰РµРіРѕ РЅР°СЃРµР»РµРЅРёСЏ. РђРёС€Р° РґР°РµС‚ РєРѕРЅС†РµСЂС‚С‹ РєР°Рє СЃРѕР»Рѕ- РёСЃРїРѕР»РЅРёС‚РµР»СЊРЅРёС†Р°, РІС‹СЃС‚СѓРїР°РµС‚ РІРјРµСЃС‚Рµ СЃ "Credo", "Opus Pro" Рё РґРµС‚СЃРєРёРј С…РѕСЂРѕРј Р РёР¶СЃРєРѕР№ РєР°РїРµР»Р»С‹. Р’ 2006 РіРѕРґСѓ РѕРЅР° СЃС‚Р°РЅРѕРІРёС‚СЃСЏ РІРµРґСѓС‰РµР№ С€РѕСѓ "Р›СЋР±РёС‚ - РЅРµ Р»СЋР±РёС‚" РЅР° LTR Рё Р·Р°РїРёСЃС‹РІР°РµС‚ Р°Р»СЊР±РѕРј РїСЂРё СѓС‡Р°СЃС‚РёРё "Opus Pro" РЅР° СЃС‚СѓРґРёРё "Mikrofona ieraksti". Р’ 2007 РіРѕРґСѓ РѕРЅР° РїСЂРёРЅРёРјР°РµС‚ СѓС‡Р°СЃС‚РёРµ РІ С€РѕСѓ LNT "Р”РІРµ Р·РІРµР·РґС‹" Рё Р·Р°РїРёСЃС‹РІР°РµС‚ РЅРµСЃРєРѕР»СЊРєРѕ РЅРѕРІС‹С… РїРµСЃРµРЅ. РўРµРїРµСЂСЊ РѕРЅР° СѓР¶Рµ РІС‹СЃС‚СѓРїР°РµС‚ РІ РїРѕР»РЅРѕС†РµРЅРЅРѕРј СЃС‚Р°С‚СѓСЃРµ СЃРѕР»Рѕ- РїРµРІРёС†С‹. Р’ 2008 РіРѕРґСѓ РђРёС€Р° РІС‹РїСѓСЃРєР°РµС‚ СЃРІРѕР№ СЃРѕР»СЊРЅС‹Р№ Р°Р»СЊР±РѕРј РЅР° Р»РµР№Р±Р»Рµ "Mikrofona ieraksti". РџСЂРёРЅРёРјР°РµС‚ СѓС‡Р°СЃС‚РёРµ РІ СЃСѓРїРµСЂ-РїРѕРїСѓР»СЏСЂРЅРѕРј С€РѕСѓ "РўР°РЅС†СѓР№ СЃРѕ Р·РІРµР·РґРѕР№ 2", РіРґРµ Р·Р°РЅРёРјР°РµС‚ РІС‚РѕСЂРѕРµ РјРµСЃС‚Рѕ. Р’ 2009 РіРѕРґСѓ РђРёС€Р° РїСЂРµРґСЃС‚Р°РІР»СЏРµС‚ Р›Р°С‚РІРёСЋ РЅР° РїРѕРїСѓР»СЏСЂРЅРѕРј РјСѓР·С‹РєР°Р»СЊРЅРѕРј РєРѕРЅРєСѓСЂСЃРµ "РќРѕРІР°СЏ РІРѕР»РЅР°", РіРґРµ СЃС‚Р°РЅРѕРІРёС‚СЃСЏ С‚СЂРµС‚СЊРµР№. MicRec РІС‹РїСѓСЃРєР°РµС‚ РµРµ СѓСЃРїРµС€РЅС‹Р№ Р°Р»СЊР±РѕРј "Dveselite", РєРѕС‚РѕСЂС‹Р№ Р±С‹Р» РЅРѕРјРёРЅРёСЂРѕРІР°РЅ РєР°Рє "Р›СѓС‡С€РёР№ РїРѕРї-Р°Р»СЊР±РѕРј" 2009 РіРѕРґР° РЅР° Р»Р°С‚РІРёР№СЃРєРёС… Р“СЂСЌРјРјРё. Р’ СЃРІРѕР±РѕРґРЅРѕРµ РІСЂРµРјСЏ РєР°С‚Р°РµС‚СЃСЏ РЅР° Р»С‹Р¶Р°С…, СЂРѕР»РёРєР°С…, Р·Р°РЅРёРјР°РµС‚СЃСЏ С„РёС‚РЅРµСЃРѕРј, Р№РѕРіРѕР№, С‡РёС‚Р°РµС‚ РєРЅРёРіРё. РџСЂРѕСЃР»СѓС€Р°С‚СЊ РїРµСЃРЅСЋ РђРёС€Рё "What For?" РјРѕР¶РЅРѕ Р·РґРµСЃСЊ, Р° РїРѕСЃРјРѕС‚СЂРµС‚СЊ РІРёРґРµРѕ СЃ РЅР°С†РёРѕРЅР°Р»СЊРЅРѕРіРѕ РѕС‚Р±РѕСЂР° - Р·РґРµСЃСЊ. I've asked my angels, why? What for do people live until they die? What for are we living? What for are we loosing? 22/01 Latvian broadcaster LTV has announced the list of finalists of the national preselection Eirodziesma 2010. The song can be heard at LTV website. National final will be held in "Juras varti" theater house in Ventspils on 27th of February. 50/50 voting system will be used first in final and then in superfinal of 3 participants on the same evening. Р›Р°С‚РІРёР№СЃРєР°СЏ С‚РµР»РµРєРѕРјРїР°РЅРёСЏ LTV РѕР±СЉСЏРІРёР»Р° СЃРїРёСЃРѕРє РїРµСЃРµРЅ, РєРѕС‚РѕСЂС‹Рµ РїСЂРёРјСѓС‚ СѓС‡Р°СЃС‚РёРµ РІ С„РёРЅР°Р»Рµ РЅР°С†РёРѕРЅР°Р»СЊРЅРѕРіРѕ РѕС‚Р±РѕСЂР° Eirodziesma 2010. РџСЂРѕСЃР»СѓС€Р°С‚СЊ РїРµСЃРЅРё РјРѕР¶РЅРѕ РЅР° СЃР°Р№С‚Рµ LTV. Р¤РёРЅР°Р» РїСЂРѕР№РґРµС‚ РІ С‚РµР°С‚СЂР°Р»СЊРЅРѕРј РґРѕРјРµ "Juras varti" РІ Р’РµРЅС‚СЃРїРёР»СЃРµ 27РіРѕ С„РµРІСЂР°Р»СЏ. РЎРёСЃС‚РµРјР° 50/50 Р±СѓРґРµС‚ РёСЃРїРѕР»СЊР·РѕРІР°РЅР° РІ С„РёРЅР°Р»Рµ Рё СЃСѓРїРµСЂС„РёРЅР°Р»Рµ РёР· 3С… РёСЃРїРѕР»РЅРёС‚РµР»РµР№, РєРѕС‚РѕСЂС‹Р№ РїСЂРѕР№РґРµС‚ РІ СЂР°РјРєР°С… С‚РѕРіРѕ-Р¶Рµ С€РѕСѓ. 15/01 Well-known in Latvia character Cukmens, famed as a fighter for cleanness, has applied for participation in "Eurovision". 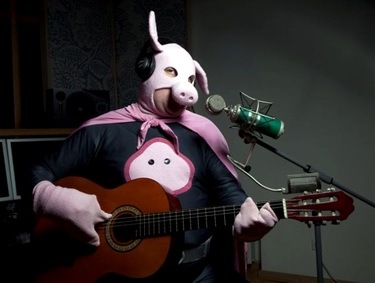 For this purpose "Swineman" has recorded the song "Antidraza" (Antirubbish) and submitted it to the national selection round of the competition. The song deals with the problem of waste and debris, and also encourages residents of Latvia and the whole Europe to care more about nature and not litter in the forest. "I am often getting sad, when I wander in woods and see a mess, rubbish and plastic bottles. In such moments, to cheer myself up, I am singing myself some tunes. So the idea to express my "green" ideas in the song has appeared. I am confident that my the song will help many people to find out how many forces are required to keep forest clean","- said Cukmens. You can listen to excerpt of Antidraza song here. Also, their interest to take part in the selection have expressed Candy (Policistas, Pirates of the Sea), Lauris Reyniks (F.L.Y. ), Martins Freimanis (F.L.Y. ), Kristina Zaharova (runner-up in Latvian and Irish preselections 2009), Aisha, Dons, band Kombuli and others. In total, at the deadline, 79 entries have been received to take part. The names of 10 finalists will be announced on January 22nd. Р�Р·РІРµСЃС‚РЅС‹Р№ РІ Р›Р°С‚РІРёРё РїРµСЂСЃРѕРЅР°Р¶ Р¦СѓРєРјРµРЅСЃ, РїСЂРѕСЃР»Р°РІРёРІС€РёР№СЃСЏ РєР°Рє Р±РѕСЂРµС† Р·Р° С‡РёСЃС‚РѕС‚Сѓ, РїРѕРґР°Р» Р·Р°СЏРІРєСѓ РЅР° СѓС‡Р°СЃС‚РёРµ РІ "Р•РІСЂРѕРІРёРґРµРЅРёРё". Р”Р»СЏ СЌС‚РѕРіРѕ Р§РµР»РѕРІРµРє-СЃРІРёРЅСЊСЏ Р·Р°РїРёСЃР°Р» РїРµСЃРЅСЋ "Antidraza" (РђРЅС‚РёС…Р»Р°Рј) Рё РїРѕРґР°Р» РµРµ РЅР° РЅР°С†РёРѕРЅР°Р»СЊРЅС‹Р№ РѕС‚Р±РѕСЂРѕС‡РЅС‹Р№ С‚СѓСЂ РєРѕРЅРєСѓСЂСЃР°. РџРµСЃРЅСЏ РїРѕСЃРІСЏС‰РµРЅР° РїСЂРѕР±Р»РµРјРµ РѕС‚С…РѕРґРѕРІ Рё РјСѓСЃРѕСЂР°, Р° С‚Р°РєР¶Рµ РїСЂРёР·С‹РІР°РµС‚ Р¶РёС‚РµР»РµР№ Р›Р°С‚РІРёРё Рё РІСЃРµР№ Р•РІСЂРѕРїС‹ Р±РѕР»СЊС€Рµ Р·Р°Р±РѕС‚РёС‚СЊСЃСЏ Рѕ РїСЂРёСЂРѕРґРµ Рё РЅРµ РјСѓСЃРѕСЂРёС‚СЊ РІ Р»РµСЃСѓ, РїРёС€РµС‚ Delfi. "РЇ С‡Р°СЃС‚Рѕ РіСЂСѓС‰Сѓ, РєРѕРіРґР° Р±СЂРѕР¶Сѓ РїРѕ Р»РµСЃСѓ Рё РІРёР¶Сѓ Р±РµСЃРїРѕСЂСЏРґРѕРє, РјСѓСЃРѕСЂ Рё РїР»Р°СЃС‚РјР°СЃСЃРѕРІС‹Рµ Р±СѓС‚С‹Р»РєРё. Р’ С‚Р°РєРёРµ РјРѕРјРµРЅС‚С‹, С‡С‚РѕР±С‹ РІР·Р±РѕРґСЂРёС‚СЊ СЃРµР±СЏ, СЏ РЅР°РїРµРІР°СЋ СЃРµР±Рµ РїРѕРґ РЅРѕСЃ РїРµСЃРµРЅРєРё. РўР°Рє Рё РїРѕСЏРІРёР»Р°СЃСЊ РёРґРµСЏ РІС‹СЂР°Р·РёС‚СЊ СЃРІРѕРё "Р·РµР»РµРЅС‹Рµ" РёРґРµРё РІ РїРµСЃРЅРµ. РЈРІРµСЂРµРЅ, С‡С‚Рѕ РјРѕСЏ РїРµСЃРЅСЏ РїРѕРјРѕР¶РµС‚ РјРЅРѕРіРёРј СѓР·РЅР°С‚СЊ, СЃРєРѕР»СЊРєРѕ РЅСѓР¶РЅРѕ СЃРёР», С‡С‚РѕР±С‹ СЃРѕРґРµСЂР¶Р°С‚СЊ Р»РµСЃ РІ С‡РёСЃС‚РѕС‚Рµ", вЂ” Р·Р°СЏРІРёР» Р¦СѓРєРјРµРЅСЃ. РЎ С„СЂР°РіРјРµРЅС‚РѕРј РїРµСЃРЅРё Antidraza РјРѕР¶РЅРѕ РѕР·РЅР°РєРѕРјРёС‚СЊСЃСЏ Р·РґРµСЃСЊ. РўР°РєР¶Рµ Рѕ СЃРІРѕРµРј Р¶РµР»Р°РЅРёРё РїСЂРёРЅСЏС‚СЊ СѓС‡Р°СЃС‚РёРµ РІ РѕС‚Р±РѕСЂРµ Р·Р°СЏРІРёР»Рё Candy (Policistas, Pirates of the Sea), Р›Р°СѓСЂРёСЃ Р РµР№РЅРёРєСЃ, РњР°СЂС‚РёРЅСЊС€ Р¤СЂРµР№РјР°РЅРёСЃ, РљСЂРёСЃС‚РёРЅР° Р—Р°С…Р°СЂРѕРІР°, РђРёС€Р°, Р”РѕРЅСЃ, РіСЂСѓРїРїР° Kombuli Рё РґСЂСѓРіРёРµ. Р’СЃРµРіРѕ Рє РєРѕРЅС†Сѓ РїСЂРёРµРјР° Р·Р°СЏРІРѕРє Р±С‹Р»Рѕ РїРѕР»СѓС‡РµРЅРѕ 79 РїРµСЃРµРЅ. Р�РјРµРЅР° 10 С„РёРЅР°Р»РёСЃС‚РѕРІ Р±СѓРґСѓС‚ РѕР±СЉСЏРІР»РµРЅС‹ 22РіРѕ СЏРЅРІР°СЂСЏ. 23/12 As ESCKaz announced last week, today Latvian national broadcaster has published regulations and has started accepting entries for the national preselection Eirodziesma 2010. Complete regulations are available here, and submission form here. Submission deadline has been set on 15th of January. Among the changes, compared to the last year is the condition that the competition will be open only to writers and performers with Latvian citizenship. This year, the national preselection will include only one final round, 10 songs selected by LTV from the submissions, will fight for the right to represent country. The list of finalists will be published by January 22nd. National final will be held in "Juras varti" theater house in Ventspils on 27th of February. 50/50 voting system will be used first in final and then in superfinal of 3 participants on the same evening. As earlier informed, national preselection is being organized in partnership with sponsors - Ventspils government and Ventspils development agency. This year, all Eurovision participation costs will be taken by LTV's sponsors without state budget money involved. РљР°Рє ESCKaz Р°РЅРЅРѕРЅСЃРёСЂРѕРІР°Р» СЂР°РЅРµРµ, СЃРµРіРѕРґРЅСЏ С‚РµР»РµРєРѕРјРїР°РЅРёСЏ Р›Р°С‚РІРёРё РѕРїСѓР±Р»РёРєРѕРІР°Р»Р° РїСЂР°РІРёР»Р° РїСЂРѕРІРµРґРµРЅРёСЏ РЅР°С†РёРѕРЅР°Р»СЊРЅРѕРіРѕ РѕС‚Р±РѕСЂР° Рё РЅР°С‡Р°Р»Р° РїСЂРёРµРј Р·Р°СЏРІРѕРє РЅР° СѓС‡Р°СЃС‚РёРµ РІ Eirodziesma 2010. РџРѕР»РЅС‹Р№ С‚РµРєСЃС‚ РїСЂР°РІРёР» РґРѕСЃС‚СѓРїРµРЅ Р·РґРµСЃСЊ, С„РѕСЂРјР° Р·Р°СЏРІРєРё - Р·РґРµСЃСЊ. РљСЂР°Р№РЅРёР№ СЃСЂРѕРє РїСЂРёРµРјР° Р·Р°СЏРІРѕРє СѓСЃС‚Р°РЅРѕРІР»РµРЅ РЅР° 15Рµ СЏРЅРІР°СЂСЏ. РЎСЂРµРґРё РёР·РјРµРЅРµРЅРёСЏ РІ РїСЂР°РІРёР»Р°С…, РїСЂРѕРёР·РѕС€РµРґС€РёС… РїРѕ СЃСЂР°РІРЅРµРЅРёСЋ СЃ РїСЂРѕС€Р»С‹Рј РіРѕРґРѕРј - РІРѕР·РјРѕР¶РЅРѕСЃС‚СЊ РїСЂРёРЅРёРјР°С‚СЊ СѓС‡Р°СЃС‚РёРµ РІ РѕС‚Р±РѕСЂРµ С‚РѕР»СЊРєРѕ Р°РІС‚РѕСЂРѕРІ Рё РёСЃРїРѕР»РЅРёС‚РµР»РµР№ - РіСЂР°Р¶РґР°РЅ Р›Р°С‚РІРёРё. Р’ СЌС‚РѕРј РіРѕРґСѓ РЅР°С†РёРѕРЅР°Р»СЊРЅС‹Р№ РѕС‚Р±РѕСЂ Р±СѓРґРµС‚ СЃРѕСЃС‚РѕСЏС‚СЊ С‚РѕР»СЊРєРѕ РёР· РѕРґРЅРѕРіРѕ - С„РёРЅР°Р»СЊРЅРѕРіРѕ СЂР°СѓРЅРґР°, РІ РєРѕС‚РѕСЂРѕРј РїСЂРёРјСѓС‚ СѓС‡Р°СЃС‚РёРµ 10 РїРµСЃРµРЅ, РІС‹Р±СЂР°РЅРЅС‹С… LTV РёР· С‡РёСЃР»Р° РїРѕР»СѓС‡РµРЅРЅС‹С… Р·Р°СЏРІРѕРє. РЎРїРёСЃРѕРє С„РёРЅР°Р»РёСЃС‚РѕРІ Р±СѓРґРµС‚ РѕРїСѓР±Р»РёРєРѕРІР°РЅ РґРѕ 22РіРѕ СЏРЅРІР°СЂСЏ. Р¤РёРЅР°Р» РїСЂРѕР№РґРµС‚ РІ С‚РµР°С‚СЂР°Р»СЊРЅРѕРј РґРѕРјРµ "Juras varti" РІ Р’РµРЅС‚СЃРїРёР»СЃРµ 27РіРѕ С„РµРІСЂР°Р»СЏ. РЎРёСЃС‚РµРјР° 50/50 Р±СѓРґРµС‚ РёСЃРїРѕР»СЊР·РѕРІР°РЅР° РІ С„РёРЅР°Р»Рµ Рё СЃСѓРїРµСЂС„РёРЅР°Р»Рµ РёР· 3С… РёСЃРїРѕР»РЅРёС‚РµР»РµР№, РєРѕС‚РѕСЂС‹Р№ РїСЂРѕР№РґРµС‚ РІ СЂР°РјРєР°С… С‚РѕРіРѕ-Р¶Рµ С€РѕСѓ. РљР°Рє РјС‹ СЃРѕРѕР±С‰Р°Р»Рё СЂР°РЅРµРµ, РЅР°С†РёРѕРЅР°Р»СЊРЅС‹Р№ РѕС‚Р±РѕСЂ РѕСЂРіР°РЅРёР·РѕРІР°РЅ СЃРѕРІРјРµСЃС‚РЅРѕ СЃРѕ СЃРїРѕРЅСЃРѕСЂР°РјРё - РіРѕСЂРѕРґСЃРєРѕР№ РґСѓРјРѕР№ Рё Р°РіРµРЅС‚СЃС‚РІРѕРј РїРѕ СЂР°Р·РІРёС‚РёСЋ Р’РµРЅС‚СЃРїРёР»СЃР°. Р’ СЌС‚РѕРј РіРѕРґСѓ, РІСЃРµ СЂР°СЃС…РѕРґС‹ РїРѕ СѓС‡Р°СЃС‚РёСЋ Р›Р°С‚РІРёРё РІ Р•РІСЂРѕРІРёРґРµРЅРёРё РІРѕР·СЊРјСѓС‚ РЅР° СЃРµР±СЏ СЃРїРѕРЅСЃРѕСЂС‹, РѕРЅРѕ РїСЂРѕР№РґРµС‚ Р±РµР· Р·Р°С‚СЂР°С‚ СЃРѕ СЃС‚РѕСЂРѕРЅС‹ РіРѕСЃСѓРґР°СЂСЃС‚РІР°. 15/12 Latvia has confirmed it's participation in Eurovision 2010. It is planned that next week national broadcaster LTV will publish regulations for the national preselection, that will take place in Ventspils, as last year, informed ESCKaz today representatives of the broadcaster. National final is preliminary set for 27th of February. "Eurovision is the only such large-scale international project, in which LTV is taking part. Even in the time of crisis, we do not want to abandon this project", said LTV director general Edgar Kots. He also emphasized that for Latvian musicians Eurovision is one of the greatest opportunities to reach international stage, expanding the audience of listeners promote exports of Latvian culture products and make the name of the Latvia known abroad. It is especially important now, when more efforts and resources have to be invested in developing the Latvian economy and popularizing culture and arts. "Most of the audience is waiting for this contest, as evidenced by it's high ratings in Latvia", added Kots. Earlier this month, broadcaster has announced that the participation of the country in contest may be in danger due to the significant raise of participation fee to be paid to EBU and no discounts offered. Though participation now is confirmed, it has not yet been determined whether the additional costs that LTV has faced in Eurovision project, will be paid by broadcaster itself, or by the sponsors, the search for which is continuing. Last year, LTV has signed 5 years agreement with local government of city of Ventspils, that hosts national finals and Agency on Ventspils development. The funds provided due to these agreements were believed to be enough to ensure participation in the show. "But we still need to keep on working on search for sponsors, as resources we have may be not enough for the promotion of Latvian contestant", told LTV. Р›Р°С‚РІРёСЏ РїРѕРґС‚РІРµСЂРґРёР»Р° СЃРІРѕРµ СѓС‡Р°СЃС‚РёРµ РІ Р•РІСЂРѕРІРёРґРµРЅРёРё 2010. РџР»Р°РЅРёСЂСѓРµС‚СЃСЏ, С‡С‚Рѕ РЅР° СЃР»РµРґСѓСЋС‰РµР№ РЅРµРґРµР»Рµ РЅР°С†РёРѕРЅР°Р»СЊРЅР°СЏ С‚РµР»РµРєРѕРјРїР°РЅРёСЏ LTV РѕРїСѓР±Р»РёРєСѓРµС‚ РїРѕР»РѕР¶РµРЅРёРµ Рѕ РїСЂРѕРІРµРґРµРЅРёРё РЅР°С†РёРѕРЅР°Р»СЊРЅРѕРіРѕ РѕС‚Р±РѕСЂР° РЅР° РєРѕРЅРєСѓСЂСЃ, РєРѕС‚РѕСЂС‹Р№ РєР°Рє Рё РІ РїСЂРѕС€Р»РѕРј РіРѕРґСѓ, Р±СѓРґРµС‚ РїСЂРѕС…РѕРґРёС‚СЊ РІ Р’РµРЅС‚СЃРїРёР»СЃРµ. РќР°С†РёРѕРЅР°Р»СЊРЅС‹Р№ С„РёРЅР°Р» РїСЂРµРґРІР°СЂРёС‚РµР»СЊРЅРѕ Р·Р°РїР»Р°РЅРёСЂРѕРІР°РЅ РЅР° 27Рµ С„РµРІСЂР°Р»СЏ. "Р•РІСЂРѕРІРёРґРµРЅРёРµ - СЌС‚Рѕ РµРґРёРЅСЃС‚РІРµРЅРЅС‹Р№ РјРµР¶РґСѓРЅР°СЂРѕРґРЅС‹Р№ РїСЂРѕРµРєС‚ С‚Р°РєРѕРіРѕ СѓСЂРѕРІРЅСЏ, РІ РєРѕС‚РѕСЂРѕРј РїСЂРёРЅРёРјР°РµС‚ СѓС‡Р°СЃС‚РёРµ LTV. Р”Р°Р¶Рµ РІРѕ РІСЂРµРјСЏ РєСЂРёР·РёСЃР° РјС‹ РЅРµ С…РѕС‚РёРј РѕСЃС‚Р°РІР»СЏС‚СЊ РµРіРѕ", Р·Р°СЏРІРёР» РіРµРЅРµСЂР°Р»СЊРЅС‹Р№ РґРёСЂРµРєС‚РѕСЂ С‚РµР»РµРєР°РЅР°Р»Р° LTV Р­РґРіР°СЂ РљРѕС‚СЃ. РћРЅ С‚Р°РєР¶Рµ РїРѕРґС‡РµСЂРєРЅСѓР», С‡С‚Рѕ РґР»СЏ Р»Р°С‚РІРёР№СЃРєРёС… РёСЃРїРѕР»РЅРёС‚РµР»РµР№ Р•РІСЂРѕРІРёРґРµРЅРёРµ - СЌС‚Рѕ Р»СѓС‡С€Р°СЏ РІРѕР·РјРѕР¶РЅРѕСЃС‚СЊ РІС‹Р№С‚Рё РЅР° РјРµР¶РґСѓРЅР°СЂРѕРґРЅСѓСЋ СЃС†РµРЅСѓ, СЂР°СЃС€РёСЂРёС‚СЊ СЃРІРѕСЋ Р°СѓРґРёС‚РѕСЂРёСЋ Рё РїСЂРѕРїР°РіР°РЅРґРёСЂРѕРІР°С‚СЊ Р»Р°С‚РІРёР№СЃРєСѓСЋ РєСѓР»СЊС‚СѓСЂСѓ. Р­С‚Рѕ РѕСЃРѕР±РµРЅРЅРѕ РІР°Р¶РЅРѕ РІ РјРѕРјРµРЅС‚, РєРѕРіРґР° СЌРєРѕРЅРѕРјРёС‡РµСЃРєРѕРµ СЂР°Р·РІРёС‚РёРµ Р›Р°С‚РІРёРё, РІРєР»СЋС‡Р°СЏ РїСЂРѕС†РµСЃСЃС‹ РїСЂРѕРїР°РіР°РЅРґС‹ РєСѓР»СЊС‚СѓСЂРЅС‹С… Рё С…СѓРґРѕР¶РµСЃС‚РІРµРЅРЅС‹С… РґРѕСЃС‚РёР¶РµРЅРёР№, РЅСѓР¶РґР°СЋС‚СЃСЏ РІРѕ РІР»РѕР¶РµРЅРёРё РґРѕРїРѕР»РЅРёС‚РµР»СЊРЅС‹С… СѓСЃРёР»РёР№ Рё СЂРµСЃСѓСЂСЃРѕРІ. "Р‘РѕР»СЊС€Р°СЏ С‡Р°СЃС‚СЊ Р·СЂРёС‚РµР»РµР№ СЃ РЅРµС‚РµСЂРїРµРЅРёРµРј Р¶РґСѓС‚ СЌС‚РѕРіРѕ РєРѕРЅРєСѓСЂСЃР°, Рѕ С‡РµРј СЃРІРёРґРµС‚РµР»СЊСЃС‚РІСѓСЋС‚ РµРіРѕ РІС‹СЃРѕРєРёРµ СЂРµР№С‚РёРЅРіРё РІ Р›Р°С‚РІРёРё", РґРѕР±Р°РІРёР» РљРѕС‚СЃ. Р Р°РЅРµРµ РІ РґРµРєР°Р±СЂРµ, С‚РµР»РµРєР°РЅР°Р» РѕР±СЉСЏРІРёР» Рѕ С‚РѕРј, С‡С‚Рѕ СѓС‡Р°СЃС‚РёРµ СЃС‚СЂР°РЅС‹ РІ С€РѕСѓ РЅР°С…РѕРґРёС‚СЃСЏ РїРѕРґ РІРѕРїСЂРѕСЃРѕРј РёР·-Р·Р° Р·РЅР°С‡РёС‚РµР»СЊРЅРѕРіРѕ СѓРІРµР»РёС‡РµРЅРёСЏ РІР·РЅРѕСЃР° РЅР° РїСЂР°РІРѕ СѓС‡Р°СЃС‚РёСЏ, РЅР° СЃСѓРјРјСѓ РєРѕС‚РѕСЂРѕРіРѕ Р•Р’РЎ РЅРµ РїСЂРµРґР»РѕР¶РёР»Рѕ РЅРёРєР°РєРёС… СЃРєРёРґРѕРє. РҐРѕС‚СЏ СЃРµР№С‡Р°СЃ СѓС‡Р°СЃС‚РёРµ РІ РєРѕРЅРєСѓСЂСЃРµ РїРѕРґС‚РІРµСЂР¶РґРµРЅРѕ, РїРѕРєР° РЅРµРёР·РІРµСЃС‚РЅРѕ, Р±СѓРґРµС‚ Р»Рё LTV СЃР°РјРѕ С„РёРЅР°РЅСЃРёСЂРѕРІР°С‚СЊ РјРµСЂРѕРїСЂРёСЏС‚РёРµ, РёР»Рё РІ СЌС‚РѕРј РїРѕРјРѕРіСѓС‚ СЃРїРѕРЅСЃРѕСЂС‹, РїРµСЂРµРіРѕРІРѕСЂС‹ СЃ РєРѕС‚РѕСЂС‹РјРё РїСЂРѕРґРѕР»Р¶Р°СЋС‚СЃСЏ. Р’ РїСЂРѕС€Р»РѕРј РіРѕРґСѓ, LTV РїРѕРґРїРёСЃР°Р»Рѕ СЃРѕРіР»Р°С€РµРЅРёРµ СЃ РґСѓРјРѕР№ РіРѕСЂРѕРґР° Р’РµРЅС‚СЃРїРёР»СЃР°, РєРѕС‚РѕСЂС‹Р№ РѕСЂРіР°РЅРёР·СѓРµС‚ РЅР°С†РёРѕРЅР°Р»СЊРЅС‹Рµ РѕС‚Р±РѕСЂС‹, Рё РђРіРµРЅСЃС‚РІРѕРј РїРѕ СЂР°Р·РІРёС‚РёСЋ Р’РµРЅС‚СЃРїРёР»СЃР°. РћР¶РёРґР°Р»РѕСЃСЊ, С‡С‚Рѕ СЃСѓРјРј, РїРѕР»СѓС‡РµРЅРЅС‹С… РїРѕ СЌС‚РѕРјСѓ СЃРѕРіР»Р°С€РµРЅРёСЋ Р±СѓРґРµС‚ РґРѕСЃС‚Р°С‚РѕС‡РЅРѕ РґР»СЏ С‚РѕРіРѕ, С‡С‚РѕР±С‹ РіР°СЂР°РЅС‚РёСЂРѕРІР°С‚СЊ СѓС‡Р°СЃС‚РёРµ РІ С€РѕСѓ. "РћРґРЅР°РєРѕ, РЅР°Рј РЅСѓР¶РЅРѕ РїСЂРѕРґРѕР»Р¶Р°С‚СЊ СЂР°Р±РѕС‚Р°С‚СЊ РЅР°Рґ РїСЂРёРІР»РµС‡РµРЅРёРµРј СЃРїРѕРЅСЃРѕСЂРѕРІ, С‚Р°Рє РєР°Рє СЂРµСЃСѓСЂСЃРѕРІ РґР»СЏ РїРѕРґРіРѕС‚РѕРІРєРё Рё РїСЂРѕРјРѕСѓС€РµРЅР° РєРѕРЅРєСѓСЂСЃР°РЅС‚Р° РёР· Р›Р°С‚РІРёРё РЅР°Рј РјРѕР¶РµС‚ РЅРµ С…РІР°С‚РёС‚СЊ", Р·Р°СЏРІРёР»Рѕ LTV. 05/12 Latvia has faced unexpected problems that might prevent country's participation in the Eurovision Song Contest 2010. Earlier this year, Director General of LTV Edgar Kots, stated that there are no reasons to withdraw from the contest due to the lack of the funds, mentioning that LTV last year has signed 5 years agreement with local government of city of Ventspils, that hosts national finals and Agency on Ventspils development. At that time it was believed that these funds, on similar proportion to the last year, are enough to ensure participation of the country in the contest. Speaking to ESCKaz in November, Latvian Head of Delegation has informed that participation is safe and they are now finalizing the national selection regulations to be published in December. However, after first deadline to confirm participation, when Latvia has duely submitted their application, LTV has received the preliminary fee calculation from EBU with indication of significant raise of participation fee compared to the last year. According to the LTV news report, EBU has not offered any discounts from this fee amount and national broadcaster is urgenly searching for extra funds to be able to pay the necessary sum. "The final decision will be made next week", told ESCKaz LTV's Zita Kaminska. It is just more than a week left for broadcasters to submit final second confirmation of their participation to EBU, as the deadline is set for 14th of December. If country confirms participation but withdraws past the deadline, it will face financial consequences. Р›Р°С‚РІРёСЏ СЃС‚РѕР»РєРЅСѓР»Р°СЃСЊ СЃ РЅРµРѕР¶РёРґР°РЅРЅС‹РјРё РїСЂРѕР±Р»РµРјР°РјРё, РєРѕС‚РѕСЂС‹Рµ РјРѕРіСѓС‚ РїРѕРјРµС€Р°С‚СЊ СѓС‡Р°СЃС‚РёСЋ СЌС‚РѕР№ СЃС‚СЂР°РЅС‹ РІ РєРѕРЅРєСѓСЂСЃРµ Р•РІСЂРѕРІРёРґРµРЅРёРµ 2010. Р’ СЃРІРѕРµРј Р·Р°СЏРІР»РµРЅРёРё, СЃРґРµР»Р°РЅРЅРѕРј СЂР°РЅРµРµ, РіРµРЅРµСЂР°Р»СЊРЅС‹Р№ РґРёСЂРµРєС‚РѕСЂ С‚РµР»РµРєР°РЅР°Р»Р° Р›РўР’ Р­РґРіР°СЂ РљРѕС‚СЃ СЃРѕРѕР±С‰РёР», С‡С‚Рѕ РЅРµ РІРёРґРёС‚ РїСЂРёС‡РёРЅ РґР»СЏ Р±РµСЃРїРѕРєРѕР№СЃС‚РІР°, Рё РІРµСЂРѕСЏС‚РЅРѕСЃС‚СЊ СЃРЅСЏС‚РёСЏ СЃ РєРѕРЅРєСѓСЂСЃР° РёР·-Р·Р° РЅРµРґРѕСЃС‚Р°С‚РєР° СЃСЂРµРґСЃС‚РІ РЅРµ СЂР°СЃСЃРјР°С‚СЂРёРІР°РµС‚СЃСЏ, РїРѕСЃРєРѕР»СЊРєСѓ LTV РїРѕРґРїРёСЃР°Р» 5 Р»РµС‚РЅРµРµ СЃРѕРіР»Р°С€РµРЅРёРµ СЃ РјСЌСЂРёРµР№ РіРѕСЂРѕРґР° Р’РµРЅС‚СЃРїРёР»СЃР° РѕР± РѕСЂРіР°РЅРёР·Р°С†РёРё РЅР°С†РёРѕРЅР°Р»СЊРЅС‹С… РѕС‚Р±РѕСЂРѕРІ Рё РђРіРµРЅСЃС‚РІРѕРј РїРѕ СЂР°Р·РІРёС‚РёСЋ Р’РµРЅС‚СЃРїРёР»СЃР°. Р’ С‚Рѕ РІСЂРµРјСЏ СЃС‡РёС‚Р°Р»РѕСЃСЊ, С‡С‚Рѕ СЌС‚РёС… С„РѕРЅРґРѕРІ, РёРґРµРЅС‚РёС‡РЅС‹С… РїРѕ СЂР°Р·РјРµСЂСѓ РїСЂРѕС€Р»РѕРјСѓ РіРѕРґСѓ, Р±СѓРґРµС‚ РґРѕСЃС‚Р°С‚РѕС‡РЅРѕ РґР»СЏ С‚РѕРіРѕ, С‡С‚РѕР±С‹ РѕР±РµСЃРїРµС‡РёС‚СЊ СѓС‡Р°СЃС‚РёРµ СЃС‚СЂР°РЅС‹ РІ РєРѕРЅРєСѓСЂСЃРµ. Р’ СЂР°Р·РіРѕРІРѕСЂРµ СЃ ESCKaz РІ РЅРѕСЏР±СЂРµ, РіР»Р°РІР° РґРµР»РµРіР°С†РёРё Р›Р°С‚РІРёРё СЃРѕРѕР±С‰РёР»Р°, С‡С‚Рѕ РІРѕРїСЂРѕСЃ РѕР± РѕС‚РєР°Р·Рµ РѕС‚ СѓС‡Р°СЃС‚РёСЏ РЅРµ СЂР°СЃСЃРјР°С‚СЂРёРІР°Р»СЃСЏ Рё С‚РµР»РµРєР°РЅР°Р» СЃРµР№С‡Р°СЃ СЂР°Р±РѕС‚Р°РµС‚ РЅР°Рґ СЂР°Р·СЂР°Р±РѕС‚РєРѕР№ РїСЂР°РІРёР» РЅР°С†РёРѕРЅР°Р»СЊРЅРѕРіРѕ РѕС‚Р±РѕСЂР°, РєРѕС‚РѕСЂС‹Рµ Р±СѓРґСѓС‚ РѕРїСѓР±Р»РёРєРѕРІР°РЅС‹ РІ РґРµРєР°Р±СЂРµ. РћРґРЅР°РєРѕ, РїРѕСЃР»Рµ РїРµСЂРІРѕРіРѕ РєСЂР°Р№РЅРµРіРѕ СЃСЂРѕРєР° РїРѕРґС‚РІРµСЂР¶РґРµРЅРёСЏ СѓС‡Р°СЃС‚РёСЏ РІ РєРѕРЅРєСѓСЂСЃРµ, РіРґРµ Р›Р°С‚РІРёСЏ РїРѕРґР°Р»Р° Р·Р°СЏРІРєСѓ РЅР° СѓС‡Р°СЃС‚РёРµ, Р›РўР’ РїРѕР»СѓС‡РёР» СЂР°СЃС‡РµС‚ РІСЃС‚СѓРїРёС‚РµР»СЊРЅС‹С… РІР·РЅРѕСЃРѕРІ РѕС‚ Р•Р’РЎ, РІ РєРѕС‚РѕСЂРѕРј СЃС‚РѕРёРјРѕСЃС‚СЊ СѓС‡Р°СЃС‚РёСЏ РІ РєРѕРЅРєСѓСЂСЃРµ РІ Р·РЅР°С‡РёС‚РµР»СЊРЅРѕР№ РјРµСЂРµ Р±С‹Р»Р° СѓРІРµР»РёС‡РµРЅР° РїРѕ СЃСЂР°РІРЅРµРЅРёСЋ СЃ РїСЂРѕС€Р»С‹Рј РіРѕРґРѕРј. РџРѕ СЃРѕРѕР±С‰РµРЅРёСЋ РЅРѕРІРѕСЃС‚РµР№ С‚РµР»РµРєР°РЅР°Р»Р°, Р•Р’РЎ РЅРµ РїСЂРµРґР»РѕР¶РёР» СЃРєРёРґРѕРє РЅР° РІР·РЅРѕСЃ Рё РІ РЅР°СЃС‚РѕСЏС‰РµРµ РІСЂРµРјСЏ С‚РµР»РµРІРµС‰Р°С‚РµР»СЊ Р·Р°РЅСЏС‚ СЌРєСЃС‚СЂРµРЅРЅС‹Рј РїРѕРёСЃРєРѕРј РґРѕРїРѕР»РЅРёС‚РµР»СЊРЅС‹С… С„РѕРЅРґРѕРІ РґР»СЏ РѕРїР»Р°С‚С‹ РЅРµРѕР±С…РѕРґРёРјРѕР№ СЃСѓРјРјС‹. "РћРєРѕРЅС‡Р°С‚РµР»СЊРЅРѕРµ СЂРµС€РµРЅРёРµ Р±СѓРґРµС‚ РїСЂРёРЅСЏС‚Рѕ РЅР° СЃР»РµРґСѓСЋС‰РµР№ РЅРµРґРµР»Рµ", СЃРѕРѕР±С‰РёР»Р° ESCKaz РїСЂРµРґСЃС‚Р°РІРёС‚РµР»СЊ РєР°РЅР°Р»Р° Р—РёС‚Р° РљР°РјРёРЅСЃРєР°. РћСЃС‚Р°Р»РѕСЃСЊ С‡СѓС‚СЊ Р±РѕР»РµРµ РЅРµРґРµР»Рё РґР»СЏ РІСЃРµС… СѓС‡Р°СЃС‚РІСѓСЋС‰РёС… С‚РµР»РµРєРѕРјРїР°РЅРёР№, С‡С‚РѕР±С‹ РѕРєРѕРЅС‡Р°С‚РµР»СЊРЅРѕ РїРѕРґС‚РІРµСЂРґРёС‚СЊ СЃРІРѕРµ СѓС‡Р°СЃС‚РёРµ Р•Р’РЎ, РїРѕСЃРєРѕР»СЊРєСѓ РєСЂР°Р№РЅРёР№ СЃСЂРѕРє СѓСЃС‚Р°РЅРѕРІР»РµРЅ РЅР° 14 РґРµРєР°Р±СЂСЏ. Р•СЃР»Рё СЃС‚СЂР°РЅР° РїРѕРґС‚РІРµСЂР¶РґР°РµС‚ СѓС‡Р°СЃС‚РёРµ, РЅРѕ СЃРЅРёРјР°РµС‚СЃСЏ РїРѕСЃР»Рµ РєСЂР°Р№РЅРµРіРѕ СЃСЂРѕРєР°, С‚Рѕ РѕРЅР° Рє РЅРµР№ СѓР¶Рµ Р±СѓРґСѓС‚ РїСЂРёРјРµРЅРµРЅС‹ С„РёРЅР°РЅСЃРѕРІС‹Рµ СЃР°РЅРєС†РёРё. Latvia: LTV needs around 120 000 lats to take part in Eurovision 2010. As declared by Director General of LTV Edgar Kots, there are no reasons to believe that Latvia may withdraw from the contest due to the lack of the funds. "LTV confirms that it's agreement with local government of city of Ventspils, that hosts national finals, and Agency on Ventspils development are signed for 5 years of cooperation. That means that we will have funds for Latvia to take part in the contest. But we still need to work on search for sponsors, as resources we have may be not enough for the promotion of Latvian contestant", declared Kots. Р›Р°С‚РІРёСЏ: Р”Р»СЏ С‚РѕРіРѕ, С‡С‚РѕР±С‹ Р›Р°С‚РІРёСЏ РјРѕРіР»Р° РїСЂРёРЅСЏС‚СЊ СѓС‡Р°СЃС‚РёРµ РІ РєРѕРЅРєСѓСЂСЃРµ В«Р•РІСЂРѕРІРёРґРµРЅРёРµ-2010В», Р›Р°С‚РІРёР№СЃРєРѕРјСѓ С‚РµР»РµРІРёРґРµРЅРёСЋ (LTV) С‚СЂРµР±СѓРµС‚СЃСЏ РѕРєРѕР»Рѕ 120 000 Р»Р°С‚РѕРІ. РљР°Рє СЂР°СЃСЃРєР°Р·Р°Р» РІ РёРЅС‚РµСЂРІСЊСЋ Neatkariga РіРµРЅРµСЂР°Р»СЊРЅС‹Р№ РґРёСЂРµРєС‚РѕСЂ LTV Р­РґРіР°СЂ РљРѕС‚СЃ, РїРѕРєР° РЅРµС‚ РїРѕРІРѕРґРѕРІ СЃС‡РёС‚Р°С‚СЊ, С‡С‚Рѕ Р›Р°С‚РІРёСЏ РјРѕР¶РµС‚ РѕС‚РєР°Р·Р°С‚СЊСЃСЏ РѕС‚ СѓС‡Р°СЃС‚РёСЏ РІ РєРѕРЅРєСѓСЂСЃРµ РёР·-Р·Р° РѕС‚СЃСѓС‚СЃС‚РІРёСЏ СЃСЂРµРґСЃС‚РІ. В«LTV РїРѕРґС‚РІРµСЂР¶РґР°РµС‚, С‡С‚Рѕ СЃ Р’РµРЅС‚СЃРїРёР»СЃСЃРєРѕР№ РґСѓРјРѕР№ Рё РђРіРµРЅС‚СЃС‚РІРѕРј СЂР°Р·РІРёС‚РёСЏ Р’РµРЅС‚СЃРїРёР»СЃР° Р·Р°РєР»СЋС‡РµРЅС‹ РґРѕРіРѕРІРѕСЂР° Рѕ СЃРѕС‚СЂСѓРґРЅРёС‡РµСЃС‚РІРµ РЅР° 5 Р»РµС‚. Р­С‚Рѕ РѕР·РЅР°С‡Р°РµС‚, С‡С‚Рѕ СЃСЂРµРґСЃС‚РІР° РЅР° СѓС‡Р°СЃС‚РёРµ РІ РєРѕРЅРєСѓСЂСЃРµ Сѓ Р›Р°С‚РІРёРё Р±СѓРґСѓС‚. РћРґРЅР°РєРѕ, РЅР°Рј РЅСѓР¶РЅРѕ СЂР°Р±РѕС‚Р°С‚СЊ РЅР°Рґ РїСЂРёРІР»РµС‡РµРЅРёРµРј СЃРїРѕРЅСЃРѕСЂРѕРІ, С‚Р°Рє РєР°Рє СЂРµСЃСѓСЂСЃРѕРІ РјРѕР¶РµС‚ РЅРµ С…РІР°С‚РёС‚СЊВ», - Р·Р°СЏРІРёР» РљРѕС‚СЃ.